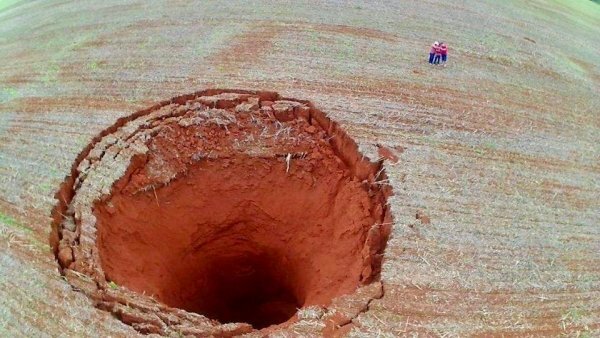 Residents in the small town of Coromandel, Brazil, recently awoke to a startling site: a gigantic sinkhole measuring approximately 65 feet wide. The sinkhole appeared in the middle of a local soybean farm and its depth could not be determined by the confused locals. As Forbes reports, the area is home to about 28,000 people who make their livelihood by cultivating coffee, soybeans and corn. 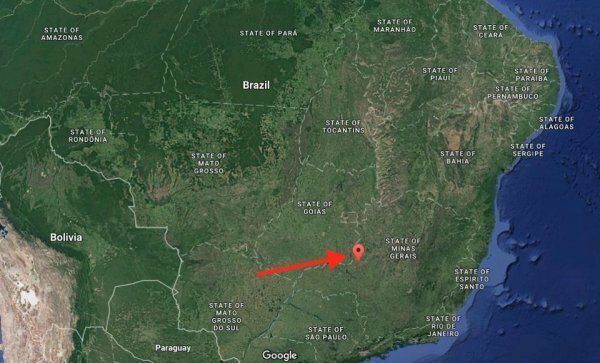 However, the town and surrounding area— located in the state of Minas Gerais — are located on pure calcareous limestone rock. Scientists believe this is the reason a sinkhole appeared out of nowhere. After studying the sinkhole to determine its cause, geologists from the Federal University of Uberlândia concluded that it most likely occurred as a result of dissolution of the underlying bedrock. Apparently, this kind of phenomenon is often seen in Florida, where limestone bedrock spans most of the state. 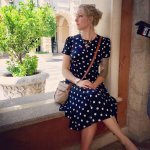 How did the sinkhole form? The development was a completely natural one and can be explained by science. Because rainwater is acidic, when it collects on calcium carbonate, the bedrock dissolves into calcium, carbon dioxide, and water. Because of this, calcium carbonate (limestone) does not withstand the elements like marble does, for example. This is why many sculptors refuse to work with the substance. Nonetheless, when limestone dissolves, it leaves a void underneath the ground which causes the weight of the sediment to cause the area to collapse. The resulting effect is a sinkhole. The area is now closed off to prevent people and cattle from falling in and getting injured.
? Oprah Winfrey Leads All Star Cast In A Movie Exploring Quantum Mechanics And Astral Travel London Buses To Swap Out Diesel For Coffee-Based Biofuel ?